Projects – Fredrick W. Baker III, Ph.D. I am heavily involved with the addition of Hybrid Instruction at The University of Tampa. UT has only had hybrid instruction in limited format and only for a few years now. A robust system is developing around the establishment of hybrid. The process currently includes a 3 stage training and review process. UT currently utilizes Quality Matters training to expose instructors to the concepts of alignment and expose them to faculty at other institutions. This stage is outsourced, but could be brought in-house with the dedication of resources. The NTI instructional course provides faculty with instructional and course design knowledge, and promotes a collaborative community of competent hybrid instructors at UT. Over the last year, I have helped establish the vision, mission, and 3 pillar objectives for NTI, encouraged and obtained some revision of the Blackboard Course Shell Template, and have pushed for course redesign that focuses explicitly on the three pillar objectives. The course has been restructured and focused on these three pillar objectives, with the first run of the new course in January 2016. I have been heavily involved in the committee work related to the HCRC, and have been influential in a number of elements such as establishing the course review system, revising the rubric from 37+ items down to 16 items, establishing the technical aspects of performing reviews, and working to establish the official hybrid policy for The University of Tampa Faculty Handbook. I am also involved in establishing policy, practice, and solutions related to a number of remaining questions related to hybrid (e.g., the role of adjuncts, approving the course/instructor combination, design guides/shell, etc.). I coordinated the establishment of the Faculty Development Studio in conjunction with the Center for Teaching and Learning and the Educational Technology Department, and led the first run in the Fall 2015 Semester. We gathered faculty from each college and read Dee Fink’s Creating Significant Learning Experiences book. We discussed a number of strategies and techniques that emerged from the book, and plan on doing a hands-on, in-depth course redesign in the Spring 2016 semester. 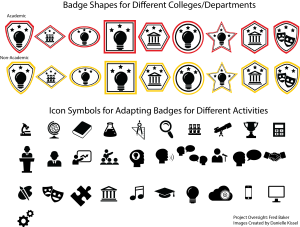 I led a project to develop an Open Badges Ecosystem at The University of Tampa. As of now, the project is complete. Examination and consideration of whether badges fit with the UT culture will determine whether a decision is made to implement, which will determine whether the project evolves more.